Join the celebration of Frank Lloyd Wright’s 144th Birthday at Barnsdall Art Park on June 10th from 6-10pm. The event is presented by Friends of the Hollyhock House in conjunction with the Art Deco Society of Los Angeles. Frank Lloyd Wright (June 8, 1867 to April 9, 1959) is one of America’s most revered and well- studied architects, famous for his prairie style and concrete block creations. What better place to celebrate his birthday than at Barnsdall Art Park, on the west lawn ofthe famous Hollyhock House, commissioned by Arline Barnsdall in the early 1900’s. 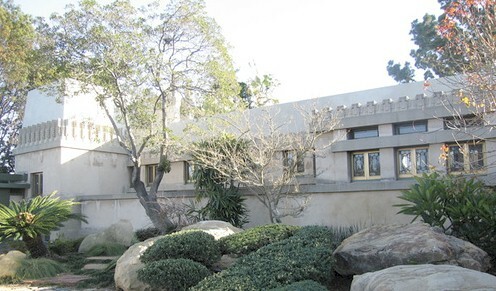 Friends of Hollyhock House is once again embarking on a major fundraiser. The event is being co-hosted by the Los Angeles Art Deco Society- a group that celebrates and preserves the architecture, art, music, dance, clothing and elegance of Art Deco. The current fund drive will continue over the next two to three years for the purpose of restoring the landscape around Frank Lloyd Wright's Hollyhock House. Now that the house itself has been restored to its original glory, it only makes sense to bring the grounds up to par! For those who have not been inside the Hollyhock House, this is a great time to go and even if you have, it’s a good time to revisit as interior photos can be taken. Interior photography is something that is rarely allowed in the Hollyhock House so take advantage of this opportunity while it is available. The 1st floor of the house will be open with docents available to answer questions and provide information. After touring the Hollyhock House, stick around for the fun! There will be food trucks, a silent auction, lots of wine and music provided by Jim Ziegler’s Swingsations and Wendy Rea for your Art Deco era pleasure, and of course, birthday cake! Eric Lloyd Wright, son of Lloyd Wright and grandson of Frank Lloyd Wright will be in attendance to help raise funds as well. Contributors of $250 or more will receive a copy of the book “Panorama Wright- Elements of Frank Lloyd Wright's Architecture in 360 Degrees ". Eric Lloyd Wright wrote the introduction to the book and will personalize the copies for those contributing $1000 or more. Tickets for the Frank Lloyd Wright 144th Birthday Celebration are on sale now at Brown Paper Tickets. Order online as tickets will be more expensive at the door. The party takes place this Friday from 6pm to 10pm. Come out and join the celebration while supporting a great cause at the same time.